It’s been a rather terrifying couple of days in Northeastern Catalonia. On Sunday afternoon fires broke out at the top of Alt Empordà which moved at great speed due to strong Tramuntana winds. Alt Empordà is a county of Catalonia that borders France, holds the much lauded Costa Brava beaches by the Mediterranean, and of course has a great deal of great wine. All signs point to these two fires in Portbou and la Jonquera being started by carelessly tossed cigarette butts. The one in la Jonquera was the most devastating as it burned an area of 14,000 hectares (35,000 acres.) Most infuriating about that one is that, while there is no hard proof yet, it was most likely started by a long haul trucker who was waiting there. You see, France wisely doesn’t let transport trucks circulate on Sundays while Spain does. So, the truckers sit there at la Jonquera from 00:00 Sunday to 00:00 Monday, waiting to go while sitting around drinking, smoking, and using the services of prostitutes that have been installed there by human traffickers. It’s horrible and this fire that most likely resulted from one of these piggish guys just emphasizes this. Many homes were lost. Four people died as a result of the fire. Countless hectares of wilderness have been destroyed. And then, there are the vineyards. It seems ridiculous to think about wine when there is so much loss, but winemaking in this area is a large source of income people along with olive growing. Added in that is the fact that while you can replant burned vineyards, it takes years for them to make wine and decades to replace those that are old growth. Thankfully by and large most of the wineries we’ve heard from have said that they are overall fine. This is mostly due to the nature of vineyards and that they function as a natural fire break, even helping the firefighters control the fire to a large extent. Fire doesn’t like to burn the barren land under the vines nor does it like to burn vines that are green and full of leaves as they are right now before harvest. 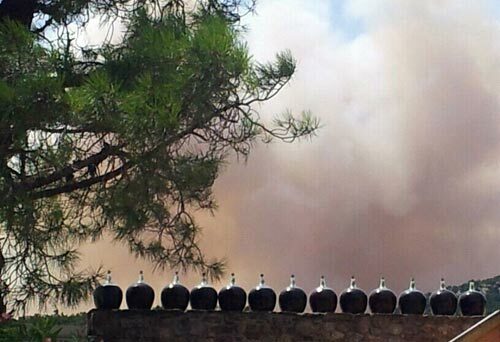 La Vinyeta and Roig Parals in Mollet de Peralada said that while the flames came near, their vineyards were untouched. Castillo de Perelada said that all of their vines are fine, but the ones in Pont de Molins got a bit smoked. Martí Fabra in Sant Climent de Sescebes said that again, the flames came near, but their vineyards are fine, although the fire will be scaring to the region for a long time to come. 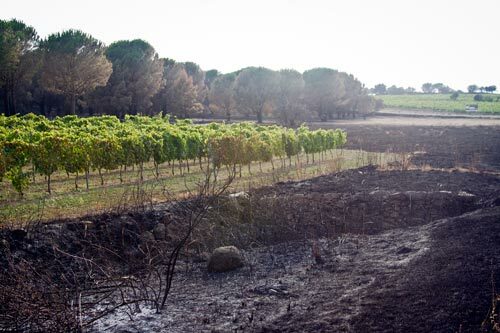 Terra Remota (which is near Martí Fabra) was also fine and posted a picture on Twitter showing how close the fire came to their vines, see update below. Although if you look at this picture of Castell de Biart, things don’t look too good. Masia Serra and Vinyes dels Aspres in Cantallops both shared photos as well of the fire get very, very close threatening the whole mountain village, but thankfully the firefighters were able to stop it and both village and vineyards remain mostly unscathed. The landscape around Cantallops is one of desolation, though. We’re still waiting to hear about Celler Generi in Agullana which might not have fared as well given that the fire was very intense around that area. The same goes for Aldea de Buscarós which is on the road to Darnius, has a lot of wilderness, and again, was at the heart of the fire. It also remains to be seen how all the wineries of Capmany made it through. Arché Pagès, Oliver Conti, Vinyes d’Olivardots, Grup Oliveda, Marià Pagès, Santamaria, Castillo de Capmany, are mostly in the center of the village, but their vineyards spread out far and wide from there. On the news there was a lot of footage of people who had lost homes in this area and only time will tell how it went. Hopefully, they’re all okay up there, but the fire was extremely devastating. But, these are just the larger, established wineries. There are a lot of people with small vineyards who make it for themselves or sell it to the larger cooperatives like the one in Espolla. Naturally, it’s very hard to contact any of them and all we can do is wish them luck and hope that their vineyards did indeed survive as natural fire breaks. Overall, a completely crap situation that could have been completely avoided. People are either sad or angry about it and rightly so. It is a huge loss for everyone, even for those not directly affected. Now that the fires seem to be finally under control, may the DNA tests on the cigarettes they found at the source of the fire link them to someone so at least there is some accountability for once. Terra Remota winery didn’t fare as well as originally thought. When out viewing the damage on Friday, we learned that they had lost two hectares at the back of their property. The photo above is from the front of the property near the road and as you can see, the flames licked up and around their vines, scorching those on the outside perimeter. It was a common scene around the area. Even scarier though is that they have a living roof on top of their modern winery and while they were in it, the roof actually caught fire. Thanks to the concrete though, they didn’t suffer any permanent damage. Beyond the grapes, one of the big losses to the area were all the cork oaks that were in the path of the flames. 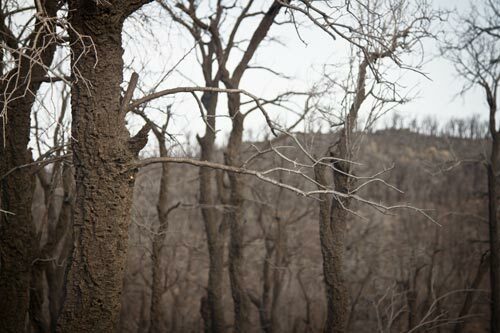 A hardy tree, some might come back years down the road, but for many, they look to be completely dead in the wasteland where the fire was the most intense near the N-II highway. Hope they get the cigarret owners. What a loss to such beautiful landscape. The first time I saw the alt empordar, it had just been completely burned, so I know just what it looked like.